Apple on Thursday released a new set of frequently asked questions related to its new, free iBooks Author tool for Mac OS X. Authors must complete an application to sell their titles on the iBookstore, and there is no upfront fee associated with creating an account. But the new iBooks Author tool does present a wrinkle for existing iOS developers. 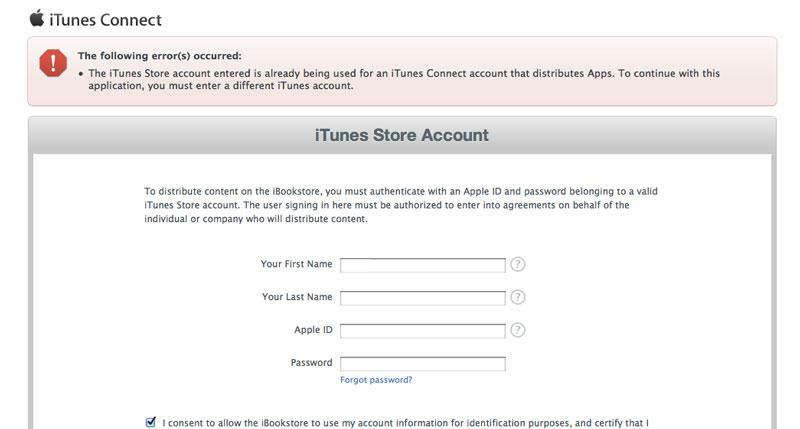 Those with an existing iTunes Connect account cannot use that account to publish iBooks —Apple requires that those users create another Apple ID associated with iBooks Author. This shortcoming is clearly laid out in Apple's iBooks Author FAQ: "If you currently have an iTunes Connect account to sell another media type, you cannot create a second iTunes Connect account with the same Apple ID. You'll need to set up a new Apple ID and use it to complete a separate book application." Apple requires that all iBooks Authors have an iTunes account with a current credit card on file. Because Apple takes a 30 percent cut of all sales, it also requires a U.S. Tax ID as part of the iTunes Connect sign-up and authentication process. Though tax information is needed, authors are not required to charge money for their iBooks. Authors can distribute self-published content on the iBookstore and make those titles available for free, if they so choose. Books must also be uniquely identified with an ISBN, or International Standard Book Number. These can be obtained in the U.S. through myidentifiers.com, or internationally at isbn-international.org/agency. If the author of a print book is making a new digital version of their title, it also requires a new ISBN. Print and digital editions of the same book must have different ISBN numbers assigned to them. iTunes Connect accounts can be associated with an individual or a company. Those who sign up for an account will be notified of their application status via e-mail. The iBookstore does not accept PDF files, only ePub files. ePub is a free electronic book standard that uses XHTML, and ePub files must be validated to ensure they comply with formatting standards. Apple's FAQ also notes that periodicals and magazines are not supported by the iBookstore. These can instead be offered through the iOS Newsstand application, which requires a standard iOS developer account for software to be submitted to the App Store.